Are you looking for some prime Earth real-estate? Maybe something inner city, right next to the Scourge people farm? Look no further than the Brownstone Rows! 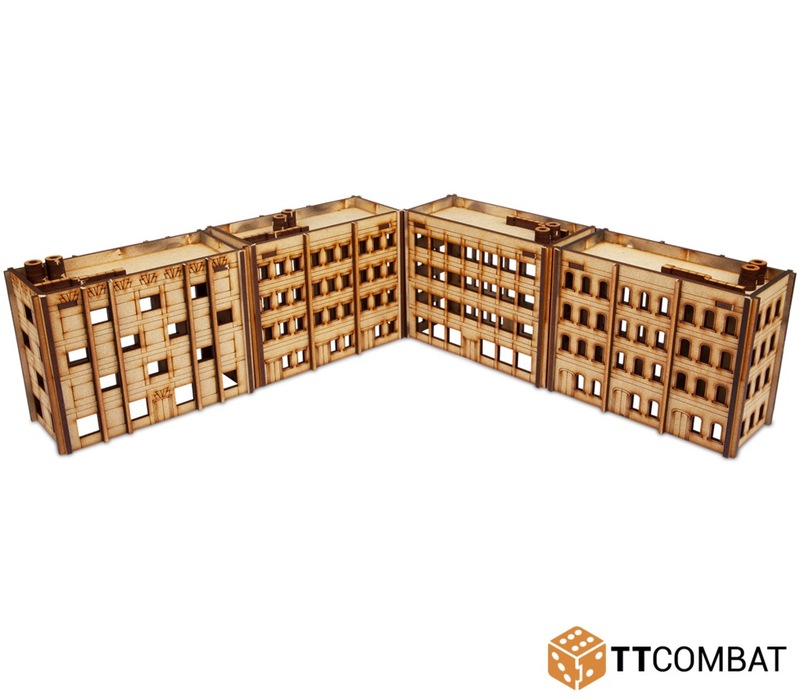 With simple construction, and a whole lot of bang for your buck, the Brownstone Rows give a fantastic way to bulk out a board with buildings. These kits don't even need glue to put together (with the exception of the roof vents), meaning they can be slotted together in seconds and then taken apart for flat storage. This kit comes with four Brownstone Rows, each of which has a unique design. Standing at 6cm high and 13cm long, they're perfect small buildings. Made from 3mm MDF, the kit is designed for games of Dropzone Commander, but will work perfectly with any similar scale games. Model supplied unpainted and requires assembly. We advise using PVA glue for the best results.